Shero: The Set - ACMA THEATRE CO.
﻿Creating a play is a long process, full of twists and turns, problems and solutions. The Voyage of the Shero took hours of work on the part of many people. Below is the journey we took to bring it to you. This was the first stage of the set, constructed in a mere ten hours of work. At this point the set contained pieces from several different production including ACMA's The Crucible, Once Upon a Mattress, Pride and Prejudice, and Oliver! It even included some additions from Northwest Classical Theatre Collaborative's Waiting for Godot and Portland Shakespeare Project's Turn of the Screw. Recycling wood and sets from other productions is a great way to save money, time, and often take inspiration from other productions and designers. Needless to say, much more work is needed to get the set to its final form, and it won't really be complete until lights, costumes, props, and actors come together on it. The second stage of the set took shape with hours and hours of work. Time was spent every day during the Tech Theatre class, and every day after rehearsal, late into the evening. 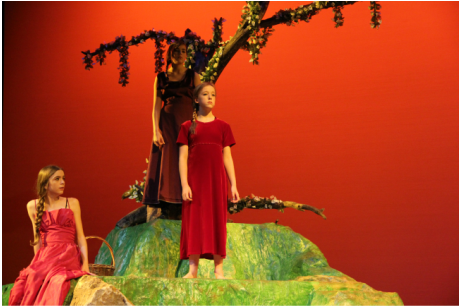 During this time lighting and sound also continued to work, designing their cues during class and rehearsals. Hills and cliffs were done with enough paper mâché to build a castle, mixed with burlap, foam, and chicken wire. Meanwhile, the set for Proof was being built in the Blue Box. All-in-all, this time gave the tech students quite a run for their money. Finally though, the set was fully functional and ready to be used by the cast. Finally, the set was finished. Or rather, almost finished. A set is never really done until actors, costumes, lights, sound, and props come together on it. It takes everyone's hard work to create a full stage picture, and by the time opening night rolls around hundreds of hours have been spent by dozens of people from across disciplines. There is, however, one final ingredient needed to create a final product: the audience. Many actors, directors, and designers will tell you that a show is never really a show until you have an audience sitting in the house, breathing the same air as the people on stage.